Let’s face it – you want to be #1 on Google! It can do a lot for your business – and shortcuts to get there can be very tempting, but extremely dangerous to the future of your business and it’s web presence. We’re gonna show you what to avoid. In a world where search engines can make you or break you, SEO has become a booming industry. Because of its demand, there is a lot of information on the web and many SEO agencies offering a quick fix. These days it is increasingly hard to distinguish what will help or hurt your business. 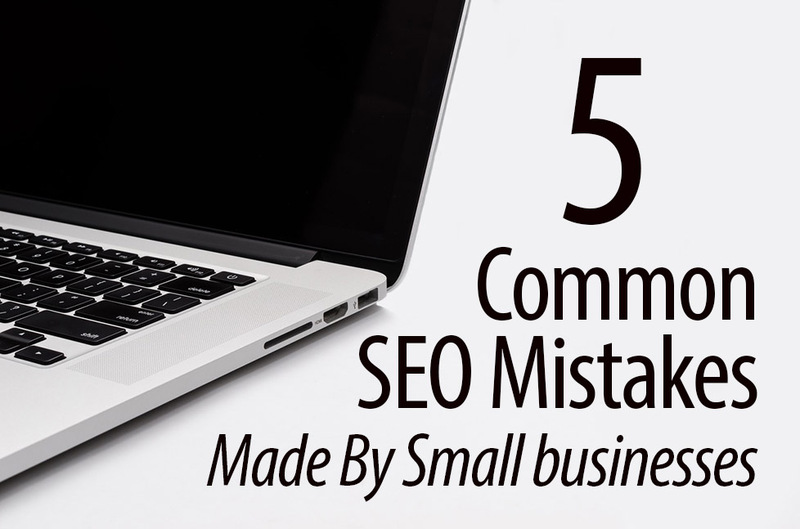 In this article, we are going to take a look at the biggest mistakes we see working with small businesses. There have been many studies on the correlation between content length and rankings, and they all seem to reach the general consensus that more is better than less. If you further research the topic, you will see that there are many different suggestions for the ‘ideal’ content length. Some sites suggest 500-700 words, others suggest going over 2000. What the ideal content length is varies depending on who you ask, but as a rule of thumb you should be writing all that needs to be said. Don’t pad the pages of your website to hit a word count, or add in unnecessary information that isn’t helpful to your intended audience. While you aren’t likely to get penalized by Google for having little information, it puts you at a serious disadvantage to others competing for the same keywords. Be aware that this isn’t just for blog content, but for all pages of your website. For any page to rank, it needs substance. Solution: Wherever possible, be as helpful as you can to your audience and go the extra mile to include more information. For example, instead of simply having a list of services, consider breaking it down and describing each. Many businesses hone in on a certain keyword or set of keywords and have the desire to be #1 for that specific phrase. This, in turn, leads them to believe that using it many times in their content should put them higher, which isn’t the case. Google’s search algorithm is extremely complex and is getting smarter every day. It is no longer necessary to use a specific phrase many times on your page to rank for that term. In fact, it’s actually strongly discouraged. Google calls this “Keyword Stuffing” and it is considered an attempt to manipulate search rankings, which can land you a penalty. Solution: There are many different ways to word a search, and even if keyword stuffing worked, it would be impossible to find and predict all the keywords a potential visitor would use. Instead, use keyword research to to understand the intent of searchers looking for your product or service, and build your site around what they would find useful and informative. Google’s search algorithm hates duplicate content, and for good reason. Could you imagine trying to research something and every page that you find was the same article, with slightly different wording? For this reason, duplicate content is to be strongly avoided. When writing for your website make sure your content is 100% unique, or you could land a penalty from Google. Copying content on the web has become so popular, that content spinning tools were developed that reword content automatically. Google has been very quick to stay on top of this though, so it is not an effective way to gain rankings or generate new content. We see this often with companies that outsource their copywriting for their website and blog. Often times the content has clearly been through a content spinner, and in some cases, it may be 100% copied. Duplicate content can also happen with content you own, which will be explained further in the next item. Solution: Be sure to vet your copywriters, because you are better off with less content than duplicate content. If you are producing your own, you can still look elsewhere on the web for ideas, but you should be looking for a way to differentiate your article and provide unique value. Google defines Doorway Pages as multiple pages that lead a user to the same place. The idea is that you can have many different pages targeting many different keywords, and is a great idea – in theory. A good example we often see is a website setup with various location focused pages. Often times these sites will have a page for every state, and in some cases a page for every city. Since the services or products are the same, every page is essentially identical with the exception of the location being changed. As you can imagine, each page doesn’t provide any unique benefit to a searcher, and is considered duplicate content. Aside from that, doorway pages are also deemed as an attempt at manipulating search results, which Google strongly dislikes. Solution: You can still have a shot at ranking in many locations, but it needs to be done with unique content. This may be a lot more work, but in the long run, can save you many headaches. It’s also worth considering using Adwords to target locations you would like to become established in. The way the information on your website is organized has a big effect on your search engine rankings. It also has a big effect on user experience. As I’m sure you have experienced, digging through a website to find a certain page can be frustrating. If users are having trouble navigating your website, it is likely that Google’s robots will, too. In some cases, certain pages that should be easily accessible can end up unintentionally buried in a site’s architecture. For example, most websites have a yourwebsite.com/about page, and Google and potential visitors likely expect your about page to be located there, too. Putting it in a location such as yourwebsite.com/our-company/about-business-name and not having good internal links to get there, could be harming the way users and robots find that page. Solution: Take time to organize your site’s pages into groups of similar or related content, and ensure that pages that land in the same groups can easily be jumped between. You can also group sets of pages by visitor intent. If you were a realtor, an example of this would be grouping together pages for those looking to buy a house, and those looking to sell. By ensuring these cross-link, you can greatly enhance user experience and overall architecture. If you notice, all of these common mistakes are penalized because they either harm the user experience, or attempt to manipulate search results. The reason Google has become the dominant search engine is because they are very serious about good user experience and usability. So much so, that if you don’t contribute to their goal of a better search, you will be penalized or removed. So, you can rest at ease knowing that your local competition isn’t conspiring with Google to make you rank lower – there is method to the madness, and your rankings aren’t set in stone and can be improved. Looking to talk SEO? Feel free to reach out.